Alphonsus is a sports enthusiast. He is a competitive softball and football player, and an avid golfer. In a fast paced society, he understands the pressures of return to play and performing at a high level. With a decade of experience treating various injuries from amateur to professional athletes, Alphonsus has always maintained his focus on delivering individualized client-centered care. After diagnosing the root cause of the injury, Alphonsus will utilize a multimodal treatment approach to restore optimal health, incorporating core and corrective exercises in order to promote an active role in the rehabilitation process. Alphonsus is also involved with the academic side of Physiotherapy. 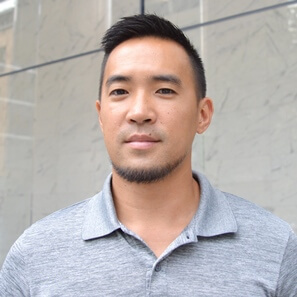 He is a clinical educator with the UofT Master of Science in Physiotherapy Program and a clinical instructor for Physiotherapy Students completing their internship with accredited universities. He is also a mentor with the Orthopeadic Division of the Canadian Physiotherapy Association and University of Western Ontario for Physiotherapists pursuing their FCAMPT designation.